Ms. Trunkes is a partner in the firm’s Commercial Litigation practice group. Focusing on the construction and real estate industries, Ms. Trunkes advocates in state and federal courts on behalf of developers, business owners, executives, contractors, subcontractors, property owners, title companies, municipalities, banks, individuals and families in resolving their complex disputes. Common issues include ownership, acquisition and development, the right to possession, the right to access, licenses, construction and design, contractual breaches, fiduciary obligations, LLC dissolution, breach of offering plan obligations, boundaries, ZLDAs, and interpretation of and compliance with administrative regulations. Ms. Trunkes also drafts and negotiates construction-related agreements such as construction manager agreements, design services agreements and license access agreements, and other business agreements such as operating agreements and commercial leases. She is frequently published and is active in a multitude of industry and bar associations, including leadership roles as Chair on the Committee on Construction Law at the New York City Bar Association and Secretary of JALBCA, the Judges and Lawyers Breast Cancer Alert. 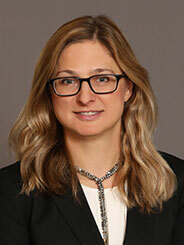 Prior to entering private practice at prominent Manhattan law firms, Ms. Trunkes served as a court attorney at the Appellate Division of the Supreme Court of the State of New York, First Department.